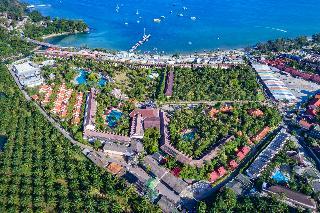 Set over 13 hectares just 350 metres from the spectacular Patong Beach this stunning beach resort hotel gives the impression of paradise. The abundant luxuriant greenery exudes natural beauty and tranquillity offering guests of Duangjitt Resort the opportunity to relax and unwind amidst a peaceful ambience. The entertainment district of Patong is a mere 10 minute walk away and the popular tourist destination of Phuket is a 20 minute drive from the hotel. It is also just a 45 minute journey from Phuket airport.The bright, airy rooms offer a relaxing haven where guests can unwind in intimate surroundings. There is also an outdoor complex with a waterslide and waterfalls among other activities to be enjoyed. 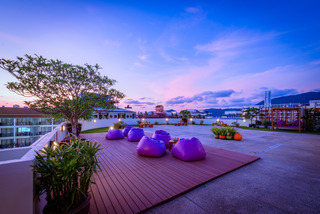 Within walking distance from Patong's nightlife and the Andaman Sea, this hotel is the ideal choice of accommodation to spend a honeymoon or a romantic getaway in Phuket, a popular destination among those who wish to relax and find their balance between body and soul. The beach resort boasts a wide range of accommodation units, all of them offering a great space in which to unwind with superior features like wooden flooring and a king-sized bed. Upgrade includes a magnificent villa with a private swimming pool for added comfort and convenience. 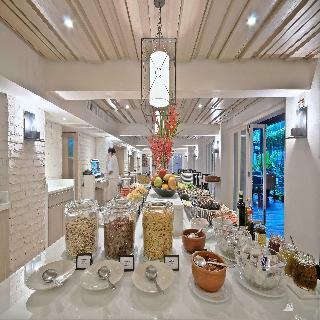 The property offers a bistro restaurant to taste real Thai essences and several meeting rooms for delegates who might need to gather at this fantastic establishment. This exclusive resort features a prime situation at the heart of Patong beach, a popular beach destination in the lively Phuket. Guests will find themselves just a 5-minute walking distance from a long sandy beach, and also close to different entertainment options and shopping opportunities. Boasting the traditional Thai charm, the rooms include a design based on local elements and contemporary amenities that will delight even the most discerning visitors. Guests staying at this outstanding property will have the chance to combine an active stay with a relaxing holiday thanks to the extensive range of onsite facilities, including a fitness centre and a state-of-the-art spa area. Younger guests will have the time of their lives in the kids’ club. Enjoying a central location in Patong just 50 metres from the stunning sandy beach, the resort Burasari Phuket places guests in an ideal setting on the island. A host of shopping venues, vibrant nightlife, bars and restaurants can be found in the vicinity and the resort offers the perfect location from which guests can explore the spectacular natural beauty this enchanting island has to offer.Boasting sophisticated style and elegant grandeur the resort reflects elements of nature swathed in vibrant colour. The luxurious accommodation options feature 9 different themes and diverse styles from Thai Lanna style with antiques and wood carvings to a more minimalist Thai design. 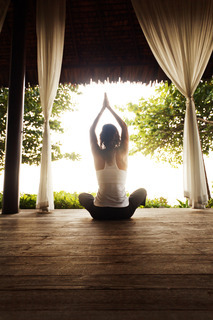 Guests can unwind amidst stunning surroundings and relish the beauty that the resort exudes. 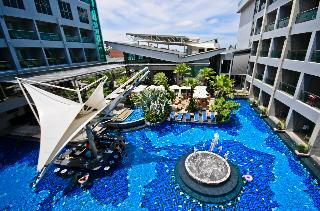 This 4 star hotel is located in the city centre of Phuket Island and was established in 2011. It is a short drive away from the Patong Beach. The Hotel has a coffee shop, an outdoor swimming pool and a fitness centre/gym. All 115 rooms are equipped with minibar, hairdryer, safe and air conditioning. 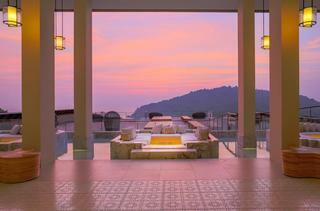 This 4 star hotel is located on the coastline of Phuket - Patong and was established in 2010. It is close to the Patong Beach. The Hotel has a coffee shop, an outdoor swimming pool and a fitness centre/gym. All 244 rooms are equipped with minibar, hairdryer, safe and air conditioning. Deevana Plaza Phuket Patong has the fantastic location in Patong Beach, Phuket - 5 minutes walking distance from the beach, the night markets, Jungceylon Shopping Mall and other entertainment areas. Phuket International Airport is approximately 45 minutes by car. There are multiple food and beverage options, from Phuket Café to Rooftop Terrace, Sun Bar, and The Lounge, the culinary experience at Deevana Plaza Phuket Patong is anything but ordinary. The in-room dining service until 23.30 hours and 24 hours fitness centre. The hotel has separate main swimming pools and kids pool, a poolside snack bar, Orientala Wellness Spa, a heavenly journey towards restoring the equilibrium between the body and the soul with 4 elements and 5 senses and a kids club. The bathroom offers guests a separate shower and bathtub. Deevana Plaza Phuket Patong is the perfect place for holidays or weekend retreats, as well as professional meetings and seminars, combining the best of international quality accommodation with authentic Thai hospitality. This luxurious resort hotel is beautifully situated just a 5 minutes' driving distance from Patong Beach. Nestled amidst tropical greenery, the hotel offers guests the best of both worlds, and is located a mere 10 minutes' driving distance from the vibrant Jungceylon Shopping Centre and the lively Bangla Road. Tempting guests with the promise of unbridled luxury and unrivaled comfort and style, this delectable hotel is the ideal choice for discerning travellers seeking a truly unique experience. The guest rooms are sumptuously appointed, incorporating elegance and contemporary style. Guests can experience the ultimate in invigoration in the spa, or can sit back in the hotel's roof top bar and revel in the spectacular beauty of the surroundings. Located at the centre of all the action in Phuket's most popular destination Patong, the resort is just minutes from the famous Bangla Road nightlife, Jungceylon shopping and entertainment centre and the wonderful golden sands of Patong Beach. Facilities include a lobby with 24-hour reception, a newsstand, fitness center, changing room and complimentary shuttle service to Patong beach and Phuket town with one-time service per day. Dining options include pool bar, café and restaurants. 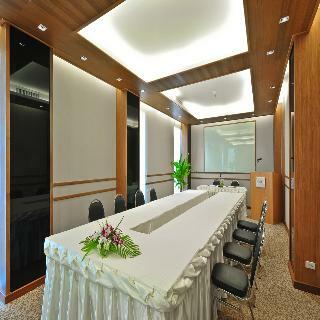 A meeting room and complimentary Wi-Fi are available, as well as room and laundry services, and medical assistance. The resort provides 4-star accommodation extended around the glistening pool and peaceful exotic Garden Wing. Guests will be able to experience a luxury service at the three-story Deluxe Wing, arranged around a centerpiece swimming pool with deck area, where guest can relax.